Grill Happy Hour: Barbecue Specialties | PrimeYours! When a male walks in front of the barbecue, he is so proud that you would think that he has just invented fire, not that he is thinking of grilling some hunks of meat. But this is the wonderful thing about the barbecue: the technique is healthy, the food is sublime, and the praises are directly proportional with the coal’s heat. Maybe that is why each country has its own methods to take precious food out of the embers. From the hot salsa of the South America to the smoked meats of the Middle East, our culinary tour is a delicious proof that nothing is better (and easier) than a barbecue session. Time: 20 minutes. 4 portions are obtained from these ingredients. The easies element to prepare on the grill is the shrimp. Shrimp can be prepared easier then sausages. Shrimps do not contain any grease, so they never get burnt and they turn into a deep pink when they are ready (after approximately 5 minutes). Even if you forget them on the grill for too long, they will taste equally good. You can leave their skin on, or if you want to be polite to your guests, you can take it off before putting them on the grill. Don’t try to clean their veins as well, as you will lose some precious time. Prepare the salsa sauce with parsley. Start the fire (and make sure that the fire isn’t too quick) and put the grill at minimum 10 centimeters away from the heat source. Grill the shrimps on both sides, until their shells become very hot or until the meat becomes very pink, or even a little brown. It is served immediately with the salsa sauce. Parsley salsa is a classical sauce of South America. It is prepared with raw garlic, chili, green lemon and some oil. We like it with a little ginger in the mixture as well, for an extra spice. You must tear the leaves from the parsley stalk and wash them well before putting them in the blender. This sauce works wonderfully on almost any grilled steak – beef, pork, chicken or fish. It is good even on vegetables if you are a vegetarian or if you fast. Mix the parsley, the garlic, the ginger, the chili and the oil in the blender. Mix everything until you get a smooth piuree, adding the oil that is needed and cleaning the ingredients from the walls of the recipient if this is necessary. Move the piuree in a bowl, add salt and pepper and thin everything with one or two spoons of lemon. Taste it, add salt and pepper if it needs more and invite everybody to dinner. Or put a lid on the sauce and keep it in the fridge, but not more than for a day. (It is only served at the temperature of the room). You get one mug of sauce. Time: 40 minutes plus marinating time, if you want this. 4 portions are obtained from these ingredients. Korean food is full of flavor. It is like Japanese food with dozens of extra spices. A lot of garlic combined with sesame in large quantities (in various forms as well), and not to forget sugar and soy. Shortly, it is the suitable food for people who like to feel their taste buds dancing wildly.The most suitable example is given by grilled chicken. Bake the sesame seeds in a pan with no oil, at a medium flame, shaking the pan until the seeds get colored on each side. Grind half of the seeds until you get a smooth flower and the rest put aside. Stir in a big bowl the sesame powder, the garlic, the ginger, the soy sauce, the oil, the sugar, the salt and pepper with half of mug of water. Notch each piece of meat deeply, than place them in the marinated above. Leave them there for an hour until you prepare the grill, or even better for a day, turning them from time to time. Girdle the grill. The fire should not be very big, with the grill placed at 10 cm away from the heat source. Grill the chicken carefully (the marinated sauce can burn easily), starting from the colder areas of the grill and moving it to the center as the sauce leaks from the meat. Turn the meat from one side to another until it gets a nice brown color. The chicken is ready when the meat is hard and elastic when you touch it. The chicken should be served hot or at the temperature of the room, garnished with mushrooms and with the rest of the sesame seeds. The multifunctional Korean marinated is good on top of anything from chicken to pork, fish, or vegetables. You can let the meat marinate for the night or even for 48 hours as long as it is in the fridge. Or you can put the meat in marinated sauce right before you prepare the grill. Actually, you don’t really need a grill, because an ordinary oven or an electric one is good too. Some words about the ingredients: you can buy sesame seeds which are already baked or even sesame powder if you have a supermarket near. But baking them doesn’t require more than a couple of minutes, you’ll see! The corn simply boiled is incredibly good, and the variant we present here – one that ends in one of the most popular snakes sold on the streets of Latin America – is even more delicious. The bitter green lemon juice is very fresh, and the swiftness with the flavor of smoked meat of the chili powder lines out the crispy sweetness of the corn beans. It is served with more coarse foods, like beef roast, pork ribs, or chicken. 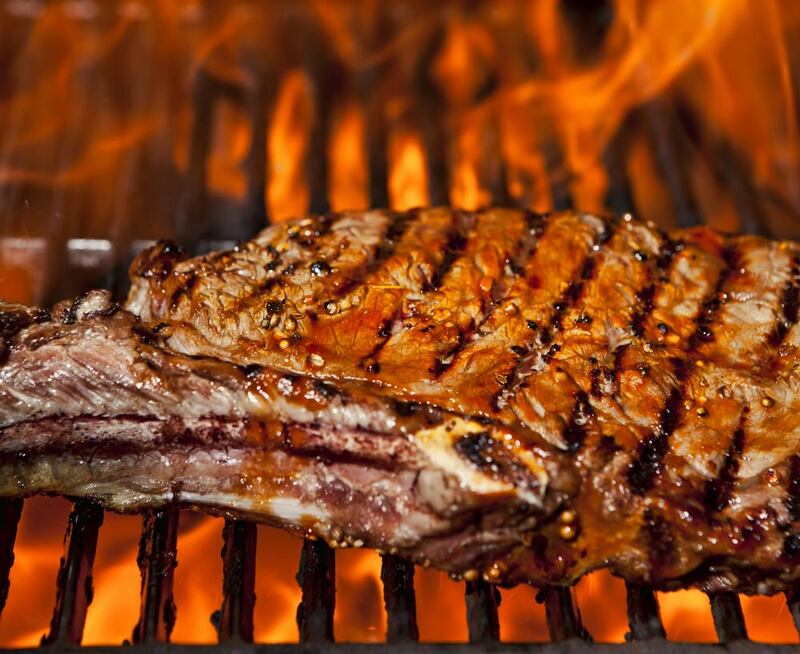 The grill must have a medium temperature, and the grating must be placed at no more than 10 centimeters from the flame. Pull the corn leaves to its end, without breaking them; throw away the floss, than put the leaves back on the corn as they were. When the grill is ready, put the corn to be grilled for 10-15 minutes, turning it from time to time. When the beans start to get a brown color, take the corn from the grill, put butter on all its sides and then put it back on the embers for 5-10 minutes until you see the beans became copper-colored. Wring out lime juice on the corn, put some chili powder and eat it at once. For this food to be really special, use quality chili powder. The one at the supermarket is a mixture of ordinary chilies, oregano, salt, and maybe some garlic – it is an amateur mixture of a weak quality. If you are not satisfied easily and you want things done by the book, you have more options: you may look in the supermarkets until you find Mexican chili, made of chilies from New Mexico or fumed paprika from Spain called pimenton. Another option would be to mix the supermarket powder with some chili from the garden, preliminary dried and turned into powder. A little garlic won’t harm, especially if you keep it in the fridge before dinner. Time: 30 minutes. 4 portions resulting from the ingredients. The Middle East gourmets love splits, and adding fresh herbs bring an extra flavor to the delicious ingredients grilled on the stick. If you use wood sticks, keep them in water for at least an hour before you start cooking to make sure that they won’t get burned very quickly on the ember. And if you use two sticks for each split, the twisting process will be easier. For more flabby meat, use the part from the lamb’s shoulder, so that even of you let the splits on the grill for a longer time the meat doesn’t get too dry. The laurel leaves should not be eaten; they are only used for the taste they give. A lot of laurel leaves, preferably not dried. Heat the grill: the fire should be medium and the grating must be placed 10 cm above the heat. Mix the oil, the oregano, the garlic, the salt and the pepper. Put the vegetable marrows and the meat in the oil mixture to make them grease on all their sides. When you are ready to work, put alternatively on the sticks the meat, the vegetable marrows and the laurel leaves. Leave the meat on the grill between 2 and 5 minutes on each side according to the power of the heat and to the way you like it prepared. Fresh grilled herbs bring a delicious flavor to the meat. Look for fresh laurel leaves at the supermarket (when they are fresh they are shiny, green and a little smooth). They have more flavor than the dried ones and they match perfectly the lamb meat. Still, if you don’t find fresh leaves, use dry ones because they are better than nothing. Rosemary is another herb that is perfect on the grill. You can use as splits sticks little branches with no leaves (you can use the leaves for marinated sauce). Or you could take entire stalks of mint, oregano, or wormwood and put them on the grill before you put the meat, because the results are amazing. Ski Touring: Who Needs A Chair Lift?